On Wednesday the 22nd of August, Corpus’ three extra-curricular dance groups performed as part of the Catholic Performing Arts Festival. 85 students from Year 7-12 took part in this performance at the Perth Convention and Exhibition Centre, performing in front of an audience of 2,500 people. The Corpus Dance Company was given the honoured place of opening the Dance section of the Festival with their original dance work Le Cirque de la Nuit. 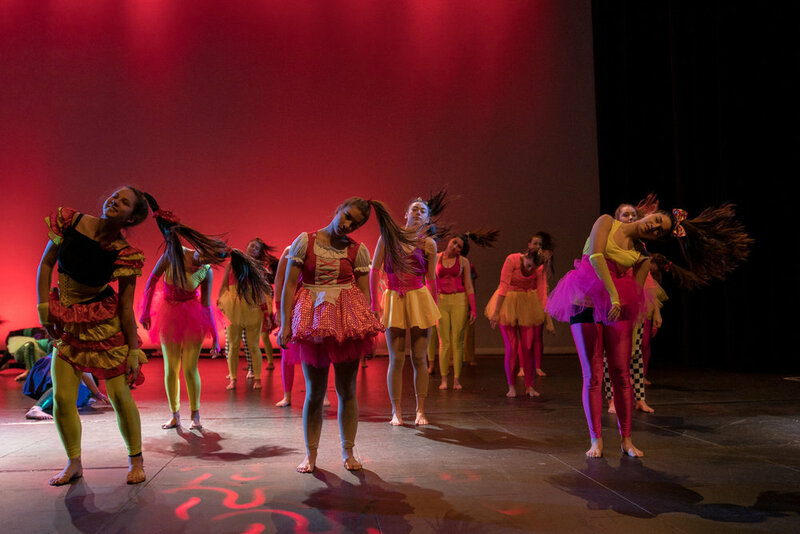 Choreographed by Caroline Fuhr, Caroline Stevenson and Year 12 Choreography Captain Breanna Furfaro, the circus themed dance was a spectacle of colour and energy, incorporating the dance genres of both jazz and contemporary. The dance was very well received by the audience and the judges commented that it had ‘a spectacular opening’ with ‘well-rehearsed and polished’ dancers. The Corpus Collective performed the original contemporary dance work Interactions choreographed by dance peripatetic teacher Mo Berrached. This exploration of life and human relationships was a captivating and mesmerising piece, with the judges commenting that it was ‘overall a well-structured dance piece’ that ‘represented the ideas very well’. The Boyz Dance Crew performed the hip hop dance work Dance Battle, choreographed by dance peripatetic teacher Jason Bird. For many of the boys this was their first time performing dance in front of such a large audience, but they approached this challenge with maturity. They were excellent ambassadors for the College, with the judges commenting that ‘all the men had great energy’ and that they made ‘a fantastic team’. The students attended many hours of rehearsals both before school and on weekends throughout Term 2 and 3 in order to be prepared for the performance. Their dedication and passion for dance throughout the rehearsal process has been a continual inspiration to the staff involved, and we could not be prouder of the students.